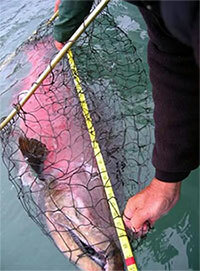 Biologists exploit species size differences to separate large king salmon from sockeye salmon. In the Kenai River, sockeye salmon average less than 24 inches in length, while king salmon often exceed 40 inches. Sonar estimates of king salmon passage have been generated on the Kenai River since 1987. Estimates were generated at the River Mile (RM) 9 site from 1987 to 2014 using a combination of dual-beam (1987-1994), split-beam (1995-2011), and multi-beam (DIDSON; 2010-2014) technologies. Estimates have been generated at the new RM 14 site since 2013 using the next generation of DIDSON known as ARIS (Adaptive Resolution Imaging Sonar). Older technology used at RM 9 (dual-beam and split-beam sonar) differentiated larger king salmon from other smaller species of salmon (primarily sockeye) based on the acoustic size of the fish (also known as target strength). ADF&G determined that the target strength produced by these technologies was a poor indicator of fish size and resulted in overestimation of passage during periods of low king salmon abundance. Newer multi-beam technology (DIDSON and ARIS) provides a more accurate estimate of fish size than did the dual-beam or split-beam technologies. Estimates of fish size using DIDSON and ARIS are generated by measuring video-like images of fish as they swim in front of the sonar. Some king salmon are as small as sockeye salmon and cannot be distinguished from sockeye salmon using sonar alone. ADF&G has used size and species information from the RM 9 netting project (See Other Tools) combined with sonar counts from the RM 14 project in an attempt to differentiate smaller king salmon from other species of salmon, but this method is sensitive to inseason variations and has required significant post season adjustments. For this reason, ADF&G now assesses inseason king salmon abundance based on daily estimates of large fish (fish greater than or equal to 34 inches [snout to tip of tail] as measured by the sonar). These large-fish estimates are more accurate and timely, and can be produced without netting data. Netting data are still used post season in conjunction with RM 14 sonar data to produce abundance estimates of all king salmon, regardless of size. 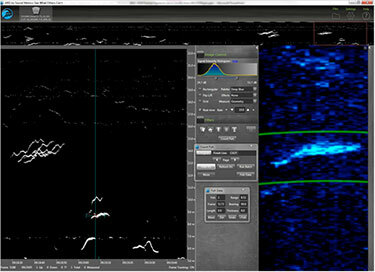 ARIS display window showing an echogram (at left) with traces of migrating fish that can be simultaneously displayed in video mode (at right) where fish images can be enlarged and measured. In addition to the ARIS-based sonar passage estimates generated by the RM 14 project, ADF&G uses three non-sonar indicators of king salmon abundance. These include sport fishery catch rates, inriver gillnet catch rates (from RM 9) and, during the late run, commercial harvest. To find out more about estimates and indicators and how ADF&G reports them, go to Other Tools. At the Kenai king salmon site, an ARIS is attached to a remote aiming unit then mounted on a tripod for deploying on each bank. Information from the sonar is then collected by computers in the site's data collection tent for processing.